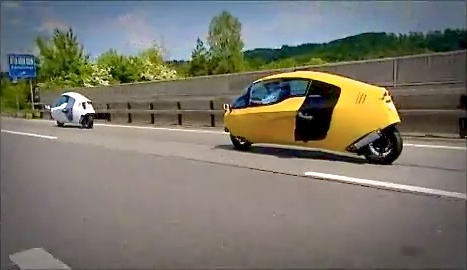 Over 3 years ago in 2008 the British hosted Gadget Show aired a fun segment on the the newly released MonoTracers featuring the original white MonoTracer prototype and the 2nd production yellow MonoTracer. Unfortunately for those living outside of Britain the segment was not viewable. Recently the segment was uploaded by a cabin motorcycle enthusiast on YouTube where I watched it for the first time myself. The host Dallas Campbell excitedly describes the MonoTracer as a futuristic transport machine, Buck Rogers, Star Wars, Podracer, Tron bike, Back to the Future style DeLorean door, etc… The engineers at Peraves gave him an thrilling performance test drive. This entry was posted in Peraves and tagged MonoTracer, Podracer, The Gadget Show. Bookmark the permalink.